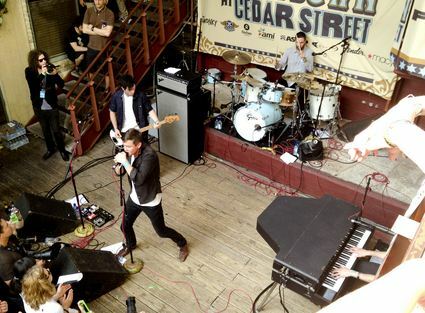 It’s a bit outrageous to see Keane in such a small venue under the bright sunlight in Austin, but there they were, at Filter magazines Cedar Courtyard party, catering to hundreds of people instead of their usual stadium sized crowd overseas. Keane may not be big in an indie kids heart but make no mistake, these guys can and have filled much larger spaces. I couldn’t resist the opportunity to go see such a large band play such a small venue. Keane has come a long way since they initially made their way into the spotlight, when they were partially regarded as Coldplay’s younger brother with the chubby kid with an angelic voice. Since then, they have trimmed up and developed a more rock orientated sound while still keeping the elements that made them big in the first place. 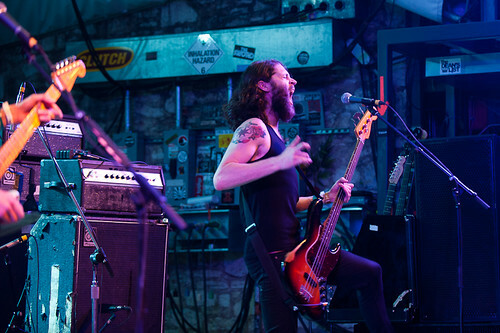 With a new album (named Strangeland) in tow, the band broke their sxsw virginity at the courtyard, delivering a solid set of new and old . It’s interesting to see the progession of Tom Chaplin, the lead singer. Infinitely more confident and with a bevvy of rock star experience, Tom moves around the stage with a purpose and delivers his tender vocals with just the right amount of sass. With the piano prominently sitting on the stage, the group previewed some tracks off the new album (including a certain track that I’m sure was Springsteen inspired) but it was the older tracks like Is It Any Wonder that had the crowd singing along. The track “Somewhere Only We Know” ended off the set. What a closer. It’s one of those songs that is quite wordy in nature but for some reason you know all the lyrics. It’s a fantastic track, induced a Cedar Courtyard singalong and you can’t really beat that kind of experience. 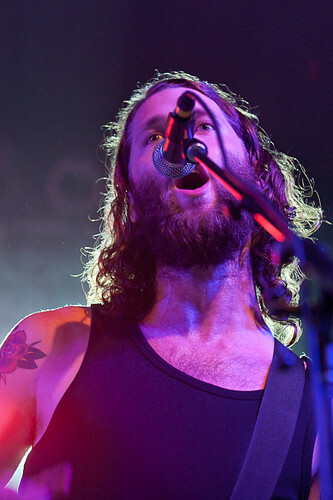 Keane plays Stubbs tonight at 11pm or midnight. For all the flack that Denver duo Tennis has been getting for their live show, I found myself quite enjoying them during their set at the Paste/Sennheiser day party on Wednesday afternoon. Tennis, if you recall, is husband and wife duo Alaina Moore and Patrick Riley whose simply constructed twee-esque music evokes memories of 70’s summer time and innocence. They have released two albums in a bit over two years, both of which have been quite successful. Their live show has been written about as a bit lackadaisical, which appears to be a black mark on an otherwise remarkable start for the band. 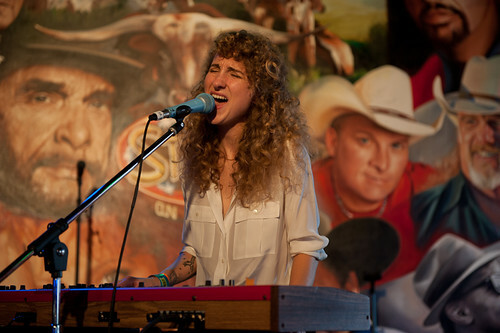 With the diminutive Alaina Moore manning the keyboard, Tennis played a set that consisted primarily of new material from the record Young and Old. I think they are a band that has chosen to play a live show that doesn’t stray far from the recorded material and given the bands live setup, it doesn’t really have much room for deviation. I don’t expect Tennis to go into an extended guitar solo halfway through the track Petition and I don’t think the casual fan should either. I guess you can say that Tennis shows are always at an even level, which is good but never really reaches that life reaffirming/defining next level. That type of show comes with time and if this group keeps on releasing projects with the quality of the first two releases, they’ll have plenty of time to work that out. Austin, TX – It can be a hard thing to stand out these days, as everyone is bombarded in crossflows of influences from every corner reachable by the internet at a background level. 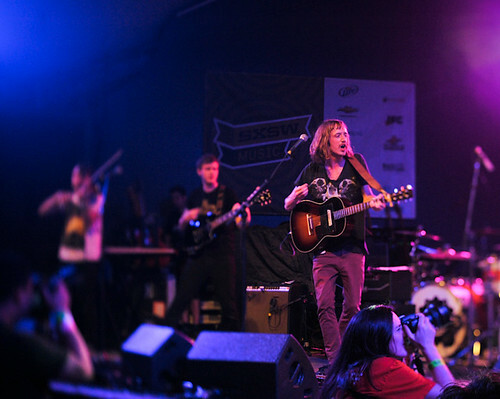 This is exacerbated at SXSW, of course. For better or worse, I trust my instincts more so than acquired taste when it comes to Southby. 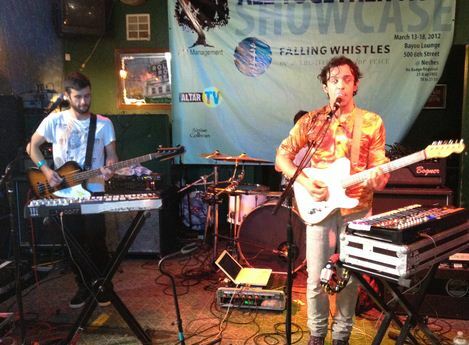 Bands often have 15 seconds to showcase their talents. I remember coworkers commenting on hearing my headphones from across the room when New Ceremony popped up among the 100 NPR samplers. It hit all the right buttons – catchy hooks, explosive chorus, and a voice/harmony that solidifies the weed-filled slipstreams into grassy fields of Austria as you skip down 6th street. Well, OK, I could be overselling. Dry the River is a 5-piece from Stratford with tattoo sleeves on at least 6 arms. This indie but counter-culture exterior belies their music though. What we heard was a soft expressions that perhaps grew out of personal experiences. The set was shorter than I’d liked, only 7 songs if memory and arithmetic serves, but not low on substance. The stage play has the heaviness of the Antlers, thin on raw physical presence, high on melancholy, and much hair. Both the main vocal and bass were laden with locks so thick that I had problems finding their eyes if they motioned their heads to mimick calligraphy brushes while jamming. A lesson against stereotyping, I guess. One song that I would have loved to hear live, Weights and Measures, was omitted. I highly suggest a listen: it’s one powerful punch that perfectly illustrates their sound. The sampler New Ceremony was played with much enthusiasm, though. There were few filler songs on display and they ended the set with Lion’s Den, I believe. This is a song that reminds me of the theme from a Taiwanese movie form my childhood, and ends with a minute-long instrumental segment that built up to an orchestra-style finish like any self-respecting rock song… and the crowd went slightly wild with solid acknowledgement for the single home run. If given the chance (apparently Rolling Stones had already labeled them something of a must-see) to play a larger venue (OK, Stubb’s is almost as big as they get in SXSW), I do believe Dry the River can deliver something even more spectacular. I’m looking forward to that. It might be a bit unfair to lump them together, but both French electronic acts Anoraak and College were playing showcases on Wednesday and I was there for both. It was a strange decision to slot Anoraak in a mid afternoon slot but the 3 piece act made the most of it with a surging set that featured the band frequently interchanging between synthesizer and guitar/bass. The drummer provided tracks like Nightdrive with a nice additional kick and the crowd was moving their feet by the end of the set. Judging by the amount of times I overhead the term “who are these guys?” in the crowd, it’s safe to say that these retro synth poppers gathered a few fans that afternoon. At the other end of the spectrum was College aka David Grellier. No doubt used to playing night clubs, College’s solo laptop act seemed a bit of a stretch for Mohawk’s massive outdoor patio setting. The crowd was packed for College’s set, which consisted of laptops and some dj-ish devices on the table with projections in the background. Aside from the glow coming off the projected screen, it was pitch black. The synth driven set sounded good and as one track melded into the other, one couldn’t help but feel that with a more intimate setting and some complementary lights, College’s synth-laden 80s summer sounds would have been a bit more effective.